Description:This is a large machine suitable for someone who has lots of snow to clear. Note that you will also need space to store it, so if you have a small garage you may have to store it outside. The electric starter will be appreciated on this Stanley 36-Inch Two-Stage Gas Snow Blower. It makes starting easy along with many other features that come with this machine. The 15 horsepower engine throws snow as far as 40 feet. With six forward speeds, 2 reverse feeds and a 36 inch wide clearing capability, this machine will make quick work of your driveway or lane way. The Stanley 36-Inch Two-Stage Gas Snow Blower comes with a powered light for night time work and an electric starter to make starting easy. The high speed impeller will throw snow as far as 40 feet. We found that the descriptions online were not very good at providing detail to allow us to confirm features etc. Please review our list provided below. 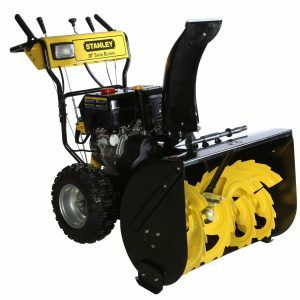 We did not find many reviews for the Stanley 36-Inch Two-Stage Gas Snow Blower. In fact only two reviews were found, one good and one bad. The positive review indicated they were very happy with this machine even though delivery was delayed and it was difficult to assemble. The other review was very negative and suggested it was a poorly made product with many poor customer reviews although we could not find them.